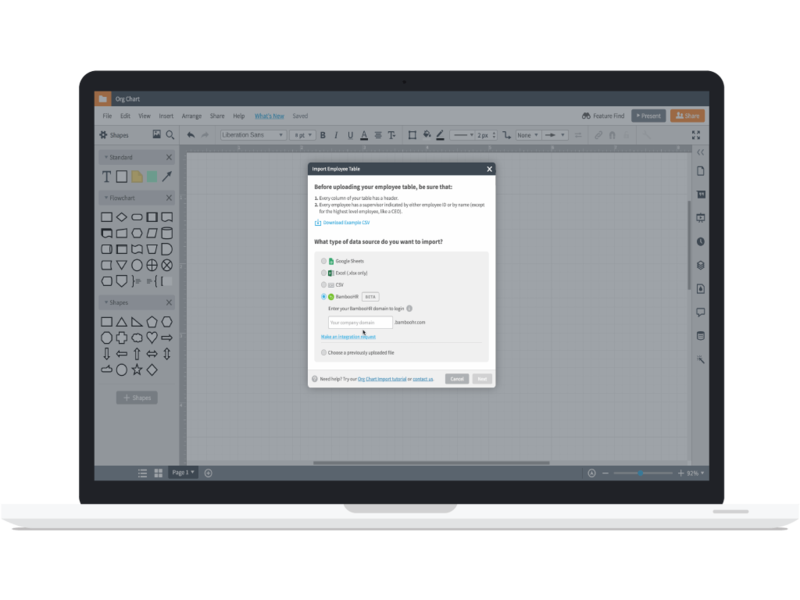 Lucidchart is the essential visual productivity platform that helps anyone understand and share ideas, information, and processes with clarity. With this intuitive, cloud-based platform, you can import employee information from BambooHR and automatically create org charts that can help you visualize your company’s structure and plan for future changes. Not only does Lucidchart make it simple to experiment with your org structure, but it also makes it easy to export or share your org charts with stakeholders. Beyond org chart creation, you can also use Lucidchart to create and share process flowcharts, mind maps, mockups, ERDs, UML diagrams, and more. 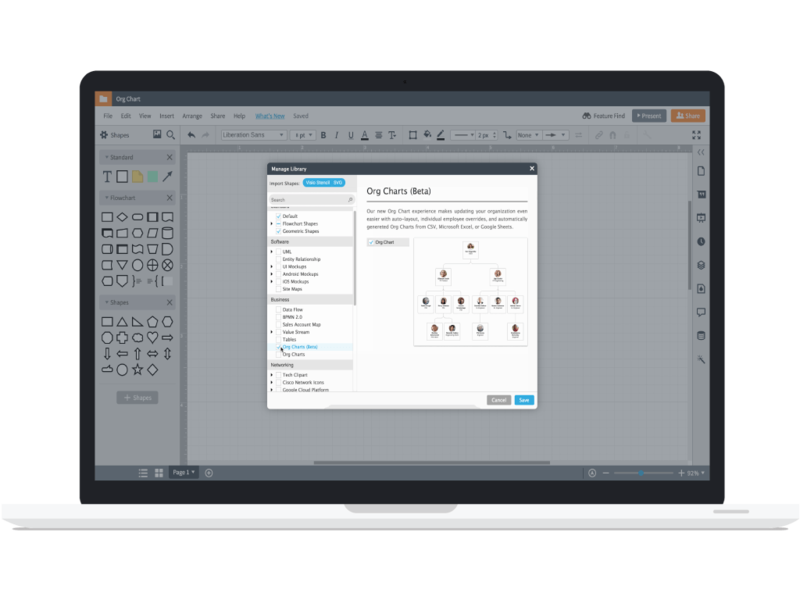 Join over 13 million users who work visually and collaborate in real time using Lucidchart. Need to present your org chart to individuals outside of your organization, such as board members or potential investors? Lucidchart makes it easy to gain stakeholder buy-in as you share org charts with the appropriate permissions, including view-only access, or embed them into PowerPoint, Word, or Google Drive. In Lucidchart, you can visualize new reporting structures without having to implement those changes in BambooHR. Once you have created your org chart, use drag-and-drop functionality to reorganize teams, show the reporting structure for temporary teams, or plan for new talent as your company scales. Smart shapes will automatically connect direct reports to managers to maintain a clean layout. 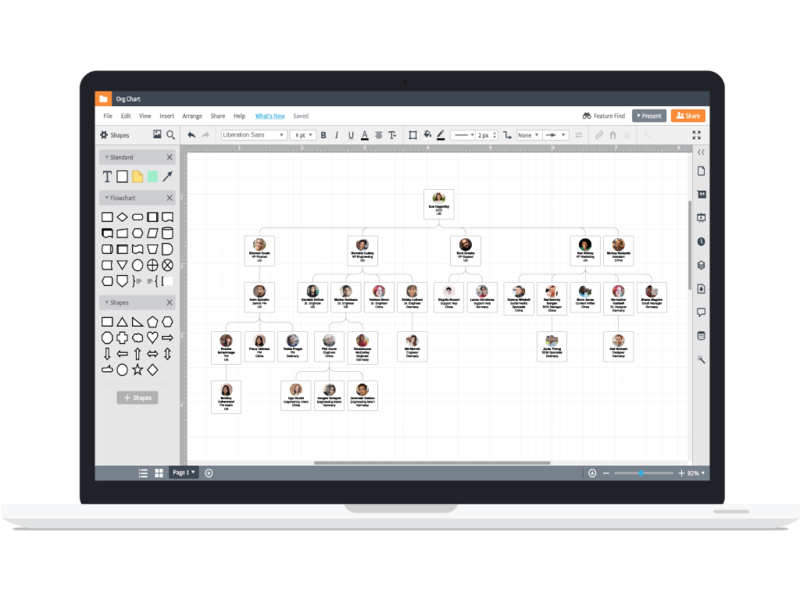 Lucidchart isn’t just for org charts—you can use this intuitive, versatile interface across your organization to document anything from simple workflows to complex software design. Create additional diagrams to bridge the gap between people and processes. After you sign up for a Lucidchart account, you can import data through the org chart shape library. Select BambooHR as the data source and select the employee information you would like to import, and Lucidchart will generate an org chart based on your preferences. From there, you can make changes to your org chart by using the editing panel or moving shapes on the canvas. Lucidchart will automatically connect direct reports to their managers and adjust the layout. Generate professional org charts to reorganize teams or plan for new people and projects.